The Guildhall Heritage and Arts Centre is situated behind the Exmoor National Park Centre/ Dulverton Library. Open six days a week in the period shown below, with free admission, it gives visitors a taste of old Dulverton, a main exhibition which changes either annually or every two years and a varied programme of short term exhibitions. 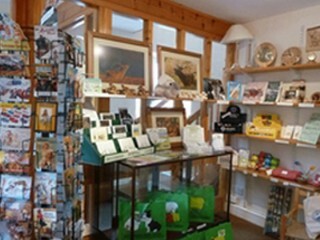 The shop has a variety of souvenirs and local crafts. Our wonderful upstairs gallery is available for hire for your own exhibition, workshop or meeting. You can visit our fascinating Archive Room, an audio-visual wonderland of information about Dulverton and its surroundings. 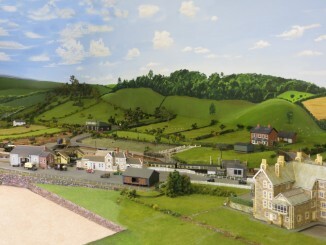 Our working model railway with its detailed reconstruction of the original Dulverton Station is a very popular exhibit. John L - 2017-08-01 22:50:08 - An interesting story, very well displayed and well told. Cheryl - Devon - 2017-08-01 22:44:53 - Best museum we've ever seen, congratulations to all who have done such a brilliant job! Peter J - 2017-07-21 12:53:27 - A fascinating, beautifully presented centre, with such friendly volunteers. Sue - 2017-07-17 10:51:03 - Fabulous little museum - really brings the local heritage to life! Ken McGowan - 2017-07-17 10:48:35 - Thank you for keeping history and heritage alive and fabulous - keep up the good work! Dorothy and Roseann - 2017-07-17 10:47:28 - Interesting and very unusual. Shops well kept. Cecily May - Canada - 2017-07-17 10:46:22 - Lovely - well thought out little museum. Judy and Alan - 2017-07-17 10:45:06 - Very interesting and well presented. Mary and John - 2017-07-17 10:44:17 - Very interesting and helpful lady. Thank you. Richard Ford - 2017-07-17 10:43:10 - Great little museum - lots of interest. Thank you! David P - 2017-05-16 10:18:05 - A lovely town and such a well managed heritage centre. The archive is so interesting. Judy & Alan F - 2017-05-16 10:03:04 - 9/5/17 (on holiday from Naramata, BC Canada) Lovely - well thought out museum! JaneT - 2017-05-16 10:01:22 - 19/4/17 Love the history of the Dulverton Station in the courtyard! Nick L - 2017-05-16 09:58:51 - 12/4/17 Very interesting especially Aubrey Herbert and turning down the 'kingdom' of Albania in 1913 - what if he had!!? Please note - our volunteers do not have 'CRB' certification (none have been refused) and therefore all children must be accompanied by an appropriate family member or approved adult at all times during their visit.